The neoclassical vision of economies characterized by rational, self-interested individuals interacting in perfectly competitive markets can have, especially for students with little or no prior study of economics, an appealing simplicity and certainty: the result is perfectly efficient, each gets what he or she deserves, and any outside interference can only be for the worse. It’s liable even to make critical-minded students start to believe that this really is the “best of all possible worlds,” and that attempts to improve it are misguided at best. 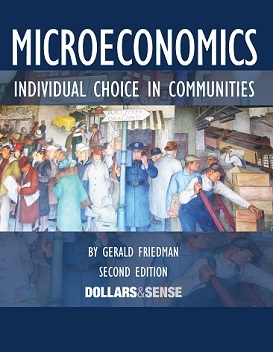 Microeconomics: Individual Choice in Communities, by Gerald Friedman (professor of economics, UMass-Amherst) is a different kind of micro textbook, laying out “micro-foundations for an alternative economics, closer to the vision of the classical economists ... and others who saw economics as a social science.” It opens up a whole new world of issues that are central to real-world economies: trust and reciprocity, the social origins of individual preferences, the ubiquity of market power in a world with economies of scale, efficiency wages and labor discipline, asymmetric information and uncertainty, public goods and collective action. This unique textbook covers all the standard topics of an introductory microeconomics course, including the profit-maximizing firm, the utility-maximizing consumer, supply and demand, price and income elasticities, factors of production and their marginal products, and so on. But this book does much more: it offers both an alternative vision of microeconomics—placing individual decision-making in the context of social norms and institutions—and cogent criticism of neoclassical theory. Students using this book will get more than just an introduction to mainstream microeconomics—they will gain a deeper and more critical understanding of it.